Graduation or Commencement Season is here. We know it by the rocking romantic notes of “I’ve Had the Time of My Life” from Dirty Dancing fame. Or by the coming of age movie marathons that include: Grease and Say Anything. No matter what music or movie marks the occasion for us it means the same thing. Graduation represents the end of one stage of our life and the beginning of another. We say goodbye to something familiar whether it represents good things or not so good things. We say hello to new opportunities and the possibility of something completely different or exactly the same. Which ever we choose. We face this transition with an odd mix of remorse and anticipation. I remember the graduations of my siblings and me. Graduation is a memorable event. When my older sister graduated I was really scared of being left behind. I begged her to stay. To put her plans on hold. To wait for me. At that point in my life all I wanted was out but she made it all bearable for me. I couldn’t imagine life at home without her. Surprisingly, she did what I asked. She gave up her opportunity to move on in order to assuage the fears of her younger sister who “needed her”. How did I repay that act of love and selflessness? Two years later when I graduated, I packed up and headed off to the college of my choice. Leaving her behind even if only for a little while. Within six months I convinced her to move to where I relocated. She lived in the dorm with me that semester because my roommate moved out (having joined a sorority). Then she got a place of her own, a job, and started living life the way she wanted. I had convinced myself that she had stayed for other reasons. I wanted to believe that it wasn’t about me so that I could move on with my life. I wish that I’d been mature enough, respectful enough, and wise enough to encourage her to go when she first had the chance. I wish I’d come into my own sooner so that I could be an independent woman (like her) and not need her the way that I did. She was always my hero. She still is. Again, it’s that odd mixture of emotions. With my sister’s graduation it represented loss. Mine represented renewal. I hope one day she can forgive me for being so selfish that I asked her to put her dreams and goals on hold. My sister has taught me a great deal about putting others first. About sacrificing. And for that I will be forever grateful. Now we are on the eve of her watching her oldest son graduate high school. He is preparing to leave behind his brothers. I know that she will be the great equalizer for the tension and emotions. I know that she’ll usher her oldest out of the nest while keeping them all connected. She will help her younger sons cope with missing their hero. She will do all these things because we’ve both learned that you have to take care of yourself before you can be any good to anyone else. Graduation means that things will change. But it doesn’t have to mean that they change for the worst like I initially thought. Everyone has his or her time. For my sister and her family the time has come to embrace the next leg of the life journey. Congratulations to my nephew for his accomplishment. I am so proud of him. Best wishes to my nephew as he heads down the road. Savor the moment of mixed up emotions. Much love, much respect and much thanks to my sister for how she has always cared for me. Sister – I love you ALL ways and Always. Show some love to those who have helped us transition from remorse to excitement! 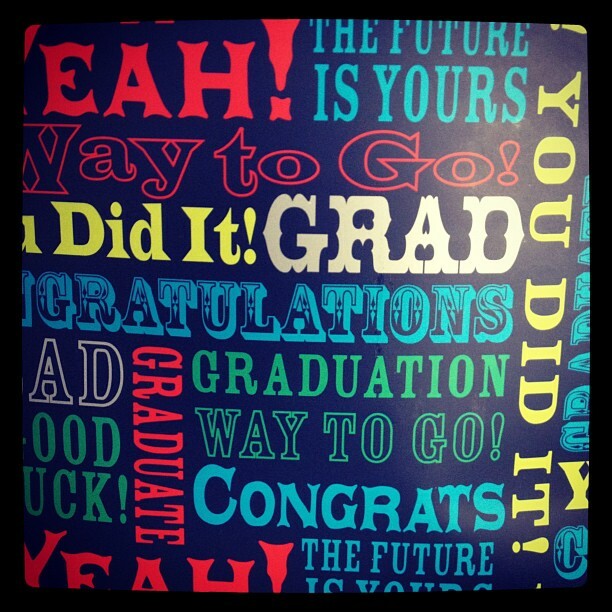 Congratulations and best wishes 2012 graduates! « Writing: I Can’t Believe I Wrote This! Wow, Gail. Very moving. I’m speechless. Hugs. Thanks Mom. It’s not always easy to share. I actually had her read it before I posted it. It feels good to talk about it.